MOM: Do you have something you need to tell me? PAMIE: … Um… uh… well, uh… do you want to maybe give me a hint or a topic? Because this seems like a trick. MOM: I do read your website, you know. I didn’t, but I do now. Again. And you’re right. I was watching that game going, “My baby’s hurt! Don’t show other people, show my baby!” But you got back up and skated again so I wasn’t worried. PAMIE: That’s why I got up. MOM: I know. But you were hurt. You were lying. PAMIE: No, I didn’t know how bad it was until the next day. I was dancing that night and everything. They said this kind of thing takes a few days before you really see what’s going on. MOM: And what did you hurt? PAMIE: I’m waiting on the results, but I think it’s my PCL. MOM: Oh, no. That’s terrible. That’s what was wrong with Sage. MOM: She got it from chasing squirrels. You and Sage, both breaking the same part. That’s kind of funny. DOCTOR: Well, I have to congratulate you on your Internet research skills. DOCTOR: You tore your PCL. It’s a relatively uncommon injury. Now I don’t think anybody would recommend surgery for you at this time. We’ll just wait to see, and if your knee doesn’t start to tolerate it, then we’d have to talk. DOCTOR: The tear. It’s torn forever, most likely. But eventually, with rehabilitation, your knee shouldn’t be able to notice it. DOCTOR: Usually. That’s why it feels like your leg is “falling off,” like you said. 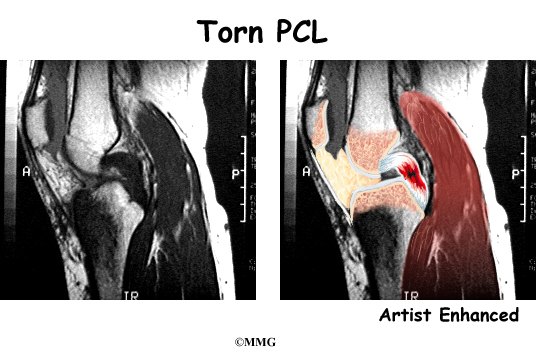 The PCL helps keep your shinbone from gliding too far back. So we put you in rehab so that your knee learns how to compensate. You’ll have to build up your quad muscles. DOCTOR: I meant you’ll have to build them back up again after the injury heals, in like a month. But when I found one online, it looked exactly like the same frame on my own MRI, where the night before I said, “This looks like something bad right here. That’s where it hurts. I bet this is it.” Diagnosing knee injuries and sending books to libraries. Is there anything the Internet can’t do? So, while the diagnosis is not exactly something to jump around about, I’m glad I will probably be able to avoid surgery, and I’m really glad I listened to my body (and the Internet) when I knew something was wrong, and I am glad I didn’t break like, my face. No skating, no running… I can control that. But no falling? That’s something I do a couple of times a week just trying to make the bed. Oh, man. This will be a challenge. Falling used to be my best skill. Now: my enemy. ME: Torn PCL. No skates for two to three months, at least. Physical therapy three times a week. Kind of what I figured. Doc complimented my Internet skillz. TARA: Hooooooooly balls. I’m sorry! But no surgery? ME: It’s okay. But I’m gonna kill it at physical therapy so that I don’t have to have surgery, nor do I limp. TARA: You are going to be the star of so many inspiring movies. ME: I am my own Emmy award-winning HBO series. TARA: I wish I could quit my job and come be in your supporting cast. ME: That’s the best pun you’ve ever made. ME: And you have the tendoncy to make really good ones. TARA: The show will be a Pam Ribon Joint. ME: You kneed to watch this. TARA: You must be swelling with pride! ME: I’m just glad I finally got a leg up in this business. You know who will be in my PCL show? Rip Torn. TARA: No premiere date yet — it’s TiBiA. TARA: I was trying to get a FEMA one! Well done. ME: Thank you. But you really kicked it off. TARA: None of this would have fallen into place without you. ME: That’s true. I’m not afraid to go out on a limb. TARA: It can be a GAMble! ME: Hee. That was so good I had to go take half a lap to calm down. TARA: Heh. I should have quit on tibia. ME: And I should have quit in the third quarter.